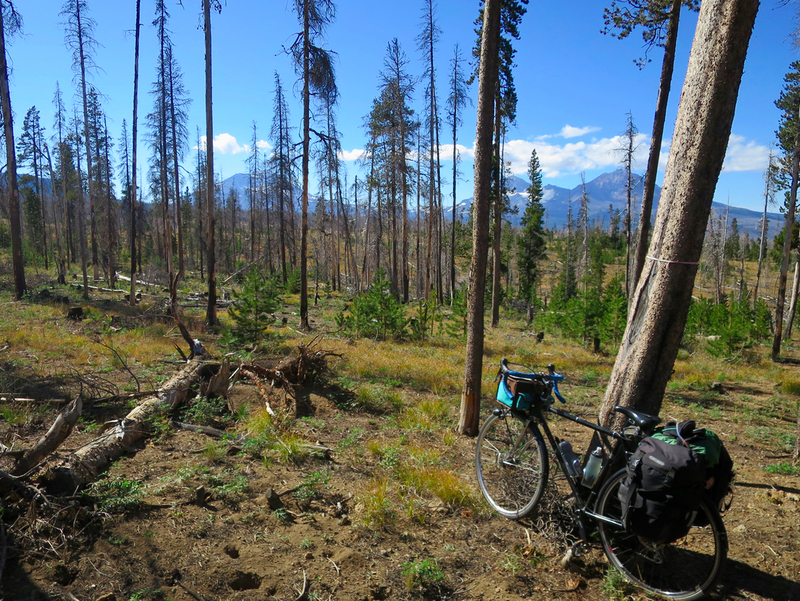 Bigger Adventures Broken Top: Another bike-and-backpack mountain circumnavigation! Check this out: a whole string of Cascade volcanoes, starting with Broken Top, then moving, left to right, to South, Middle, and North Sisters, then, smaller, Mt Washington, 3-Fingered Jack, then Mt Jefferson. Just out of the frame after that is Mt Hood: Cascade volcanoes stretching right from where I was standing all the way up to the border with Washington, 200 miles away. 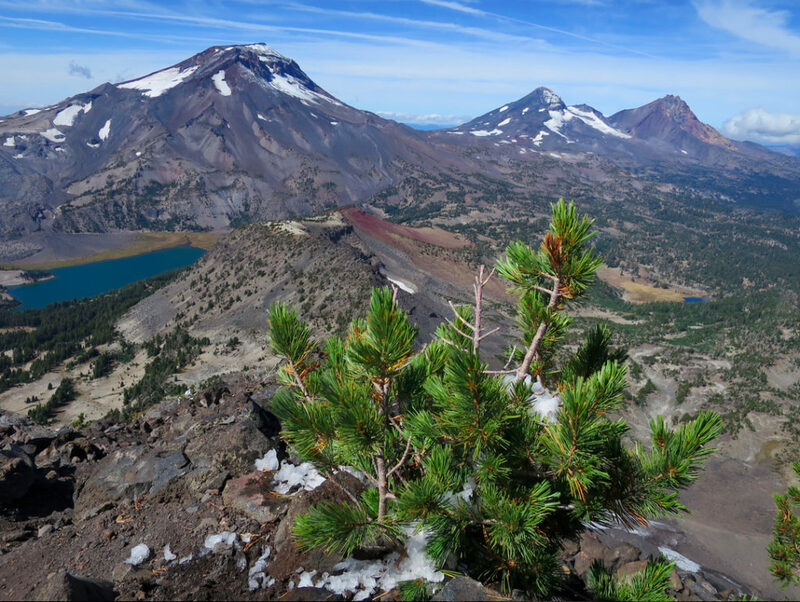 This was just one of the ridiculously amazing views from my semi-recent circumnavigation of Broken Top, another 5-day bike-and-backpack adventure. Like when I backpacked the Loowit Trail, I used a day on both ends for bike travel, then had three days of backpacking in the middle. Unlike the Loowit Trail, which was a cool 75 miles away from my door, the trailhead for this hike was a hefty 112 miles from Eugene, which I Amtrak-ed down to. So the bike travel was a little more committing this time. Here was one secret weapon, though: the #91 Lane Transit District bus from Eugene to McKenzie Bridge. On my way out, I was able to take that morning bus eastward. For the amazing price of $1.75, mass transit took me the first 54 miles of my commute — great deal, right?? Which was fantastic, because even biking only the remaining 58 miles (with their approximately 7,500ft of elevation gain, most of which felt like it came right at the end, even though that’s not true since a lot of it was to get over McKenzie Pass right off the bat) — that definitely felt like enough for the day. I was pretty done by the time I finally found a sweet little stealth camp right by a creek and tucked away near my trailhead. On the way home, the 91 bus schedule didn’t play well with the timing of my bus from Eugene back to Portland, so I ended up biking the whole thing. Which was fine, though I wish I’d eaten more than one sandwich and one cookie when I finally got back to Eugene. I always forget how hungry biking can make me, since it feels just like another part of normal life, but by the time I got back to Portland, I was so hungry again that I was ready to eat my bike shoes. 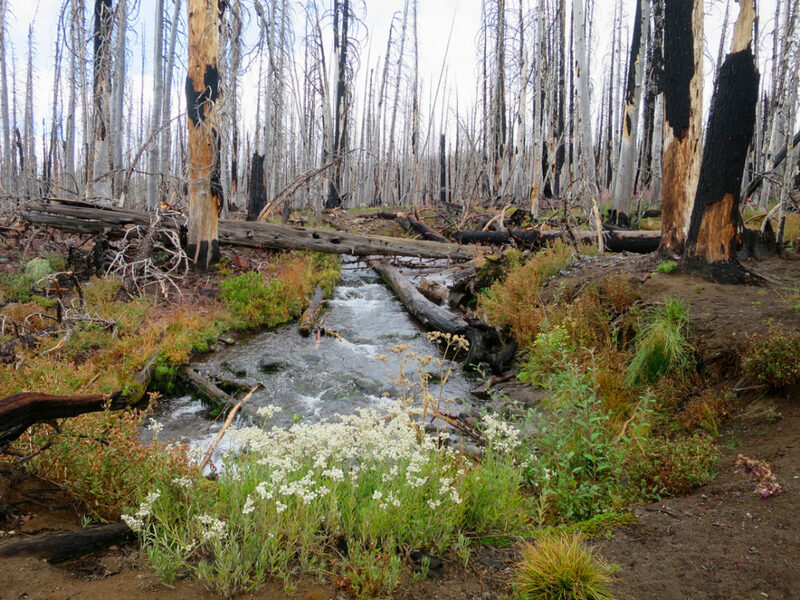 So, what does a circumnagivation of Broken Top hold? It holds so many mountains from so many different angles! So many owls (including a long-eared owl, which I’d never seen before in my life!). And a lot of solitude, despite the 3 Sisters Wilderness being a fairly popular spot (it probably helped that I was out Sunday-Tuesday rather than a weekend proper). 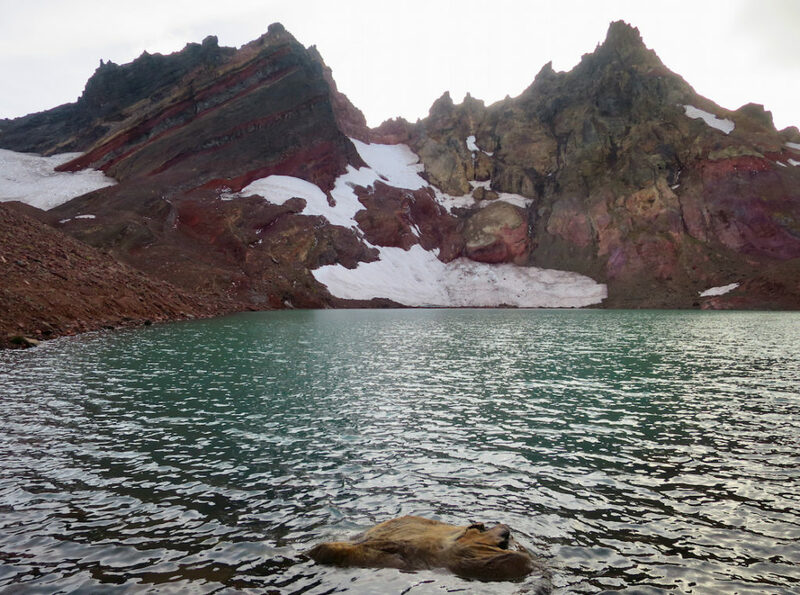 It held an impromptu scramble almost to the top of Broken Top, until I got sketched out by the ice that had accumulated the day and night before while it rained on me all day. It held a lot of time for wonder, and sitting quietly, and thinking, and writing, and walking, and otherwise being the stasia I want to be. And, my favorite, it had some awesome route-finding, since there’s no official trail that circumnavigates where I wanted to go, but there is an unofficial one that is pretty easy to follow if you’re okay with ambiguity and ridge-traversing. That was maybe my favorite part, not just mindlessly following a route, but actively being engaged in route-finding and having my mind blown with each new amazing view. 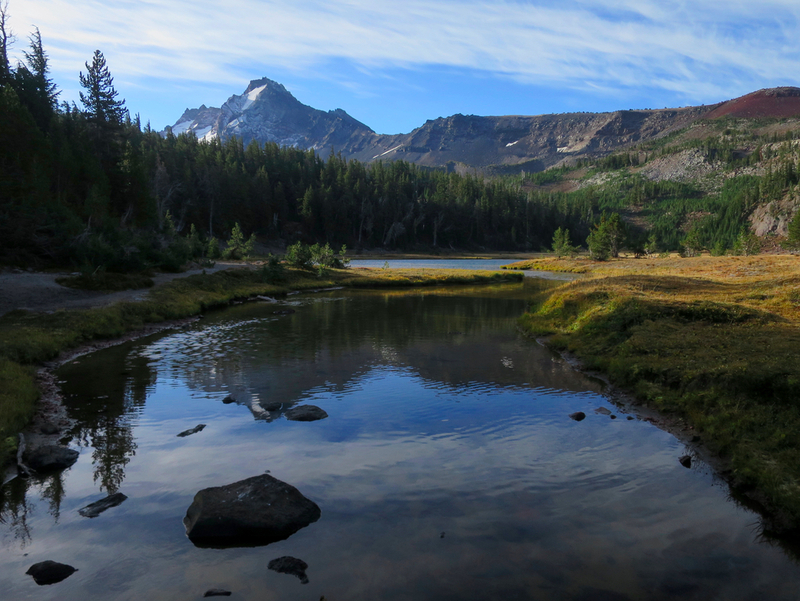 I also found two of what might be my favorite campsites ever: one at Golden Lake, and one at No Name Lake. Damn. I love alpine camping, even if I had to sleep in every single one (really. Every. Single. 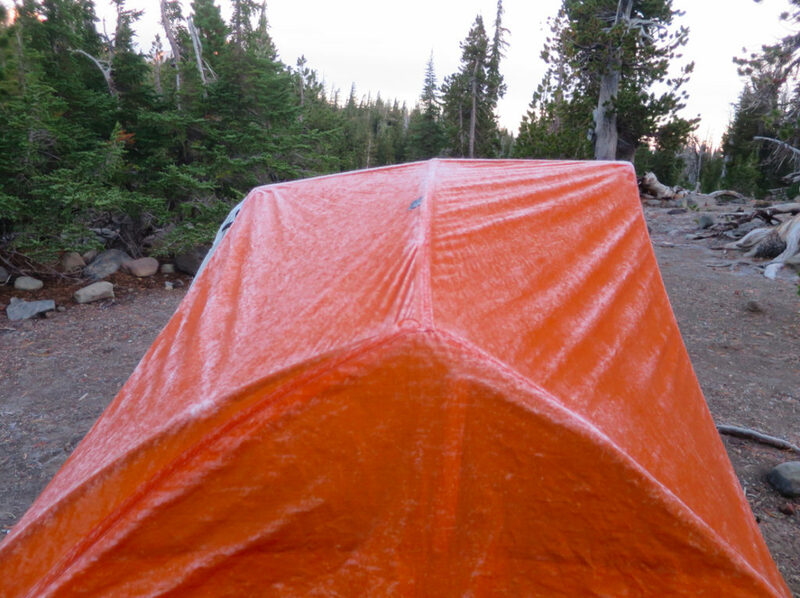 One) of my layers and my entire tent, inside and out, was a solid chunk of ice in the mornings. Oh, and some crazy wind gusts blew my tent with all my things in it over one evening, which, sad to say, ripped all my stakes out of the ground and ripped a hole in my rain fly. Alas! These smaller-scale adventures — 5 days as opposed to, say, the three weeks I’d been able to take with my previous job — are definitely keeping me sane so far. Though I miss re-calibrating my sense of time, something I feel like needs at least a week to settle into, I do feel like I’ve gotten at least a dose of the adventure and wilderness and scrambling and unknown-ness and the soul-expanding that goes along with nonmechanized space and electedly being outside for days at a time. I realize I’m still pretty darn lucky to be able to take even 5 days, repeatedly. Oh man. But there’s always the what ifs in the back of my mind. Some of it is fall, the before-hunkering-down-for-the-winter energy that makes me want to rip out all the stuffing of my life and look at it hard before I decide what to put back in, what to keep, what to throw away. Some of it is always being seduced by the little towns, how much of a big-breath relief it feels to be outside of ginormous-feeling Portland for a while. Most of it is the grass being greener, always greener. But on the whole, I feel like I’m doing pretty well for myself with these mini adventures. And I’m grateful for the time to take them, and the health to enjoy them, and the home to come back to when I’m done with them. And there are more pictures here! Gross about the dead elk in your water! You are an amazing spirit! I was so intrigued last year while hiking the Muir trail and seeing so many single women hikers out there. But the JMT is busy and one is almost never alone. I’m in awe of your solo trips and your capabilities in self-sufficiency. Two things: I hope you write a book someday, and, where do you leave your bike when you start hiking? Aw, thank you! :) That’s super sweet. Great trip and fantastic photos. Love that Long- Eared Owl! Isn’t that owl the best?? :) Thanks for the thought!